It may seem silly at first, because most people don’t think twice about how they peel potatoes. I mean, it’s just one of those boring kitchen tasks that has to get done, right? Well, the real question is… where do you peel your potatoes and what do you do with all the potato skins? If you just toss them down the kitchen sink and run the garbage disposer to get rid of them, I encourage you to STOP DOING THAT. Believe it or not, it’s actually the starch in the potatoes (and potato skins) that is the problem. It turns into a gummy glue causing the potatoes to wrap around a garbage disposal’s moving parts and ultimately clog drain pipes. So instead of sending potato peels down the drain, you should peel potatoes into a strainer or into the sink with something covering the garbage disposal. 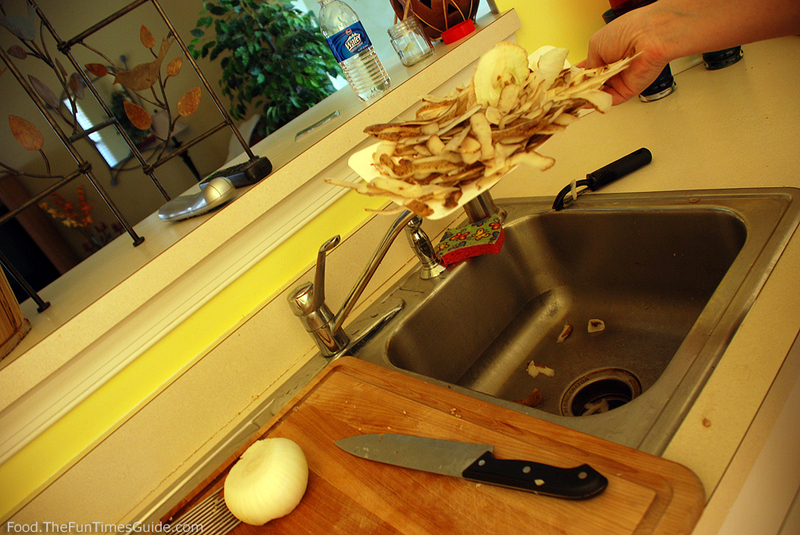 Then, toss those potato peels into the garbage (…or select one of the following ways to use potato peels). Step #1: Place a silicone cutting board (basically, just a very thin & flexible cutting mat) over the drain in the kitchen sink. 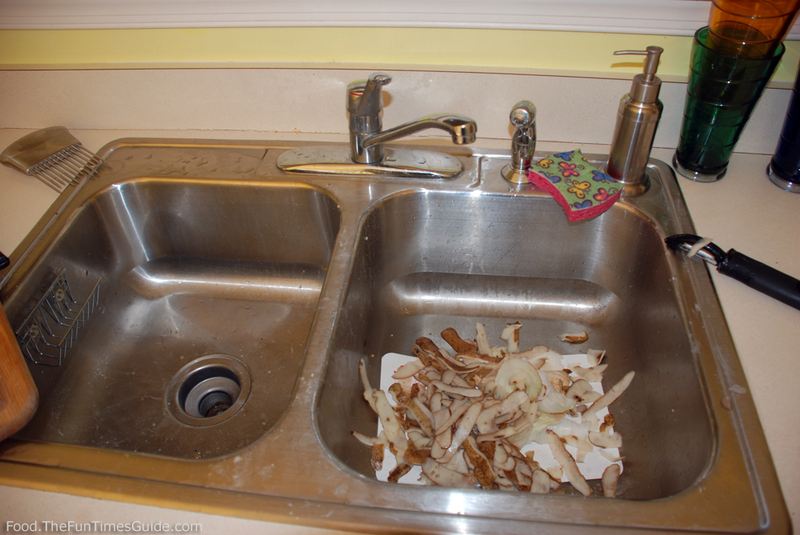 It rests loosely over the drain, which enables you to still run water to clean off each of the potatoes immediately after peeling them without the risk of any potato skins going down the drain. Step #2: Once you’re done peeling potatoes, gather up all the potato skins that are in your skin, and carry them to the garbage on the silicone cutting mat. Step #3: I tried using a “garbage bowl” like Rachel Ray uses, but I found that it took up too much valuable counter space and it just got in the way. So I sometimes just use a plastic grocery store bag hung from the handle of my kitchen cabinets above the countertop. #2 Compost them. Simply add the potato skins to your growing collection of food scraps to make a nice compost for plants. Or use them directly in your garden. They’ll replenish the nitrogen in the soil. #3 Fry them. Deep frying may not sound very appealing, but these are to die for! #4 Make potato peel broth or soup. Basically, you just simmer, flavor, and enjoy. #5 Make potato water. It can be used in so many different ways. Top 5 Things To Do With Potatoes – make microwaved potato chips… yum! 101 Things You Can Do With A Potato – a book filled with lots of fun ideas!